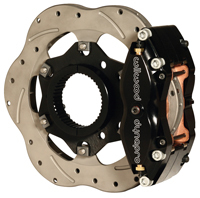 Wilwood’s GP320 Sprint Left Front Brake kit offers increased braking torque and thermal performance of the GP320 4 piston calipers. 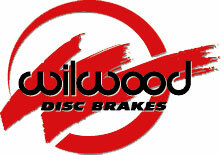 A definitive increase in braking and durability over traditional aluminum or steel rotor systems. Mounts are included for standard Sprint spindle to match the included 10.50 x 0.19” Super Alloy rotor. 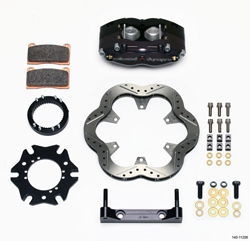 Also includes Composition Metallic brake pads, lightweight aluminum dynamic mount 3-pin rotor adapter and T-nut hardware kit. Dynapro Radial Sprint Inboard Kit Features: A fully engineered bolt-on brake system for sprint car quick change rears with 3.00 x 46 splined axles. 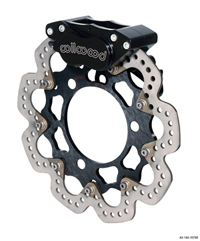 With Super Alloy.810 vented discs and a newly designed dynamic mount rotor axle clamp, are the lowest rotating weights available for Sprint racing. • The lightweight advantages of the Super Alloy rotor are combined with high durability & long wear. • Forged billet DynaPro radial mount calipers with Composition Metallic pads, produce superior stopping power and consistent fade-free response. 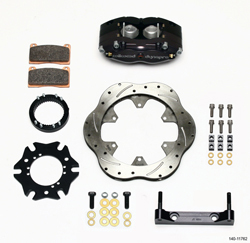 Kit includes Axle Clamp with Dynamic Mount Rotor Adapter assembly with T-nuts and Radial Mount Bracket and mounting hardware. Compound Application Quantity Part No.